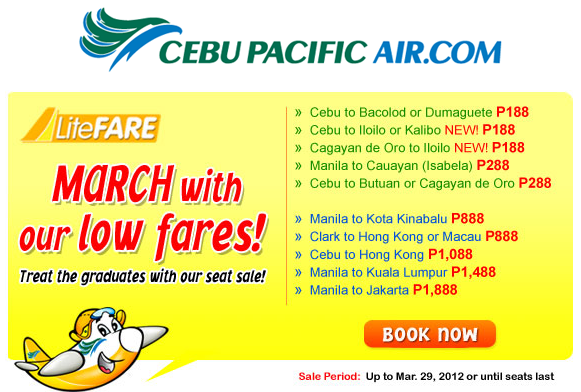 PROMO Fare 2012: The Philippines’ largest national flag carrier, Cebu Pacific (PSE:CEB) slashes fares off its routes to the ASEAN region with a seat sale from March 26 to 29, 2012 or until seats last. For travel from May 1 to July 31, 2012, passengers can buy P888 seats from Manila to Kota Kinabalu, as well as from Clark to Hong Kong or Macau. P1,088 seats are also up for grabs from Manila to Ho Chi Minh, Hong Kong or Brunei, and from Cebu to Hong Kong. Meanwhile, those traveling from Manila to Kuala Lumpur and from Cebu to Singapore can buy P1,488 seats, while those traveling from Manila to Jakarta can buy P1,888 seats. CEB operates flights from the Philippines to the most number of capital cities in the ASEAN, and serve the most number of routes. It offers more than 90 flights per week from the Philippines to 8 ASEAN destinations in 6 countries. 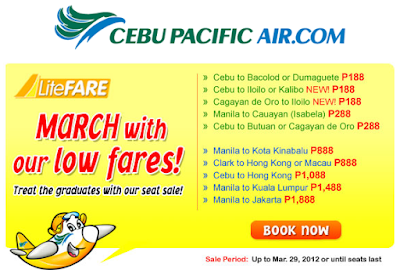 “Our passengers can also enjoy CEB’s trademark lowest fares and extensive network with a domestic seat sale for travel from June 1 to July 31, 2012. Those traveling from Cebu to the ASEAN can grab these best travel deals now,” said CEB VP for Marketing and Distribution Candice Iyog. P188 seats are available from Cebu to Bacolod, Dumaguete, Iloilo, Kalibo, Ozamiz, or Tacloban. The same fare is available from Cagayan de Oro to Davao or Iloilo; or from Zamboanga to Tawi-Tawi. Passengers can also avail of P288 seats from Manila to Cauayan (Isabela), Laoag, Legazpi, Naga, San Jose (Mindoro), Tuguegarao or Virac. The same fare is up for grabs from Cebu to Butuan, Cagayan de Oro, Davao, Dipolog, General Santos, Legazpi, Pagadian, Surigao or Zamboanga; and from Davao to Iloilo or Zamboanga. Iyog added that guests can also book hotel deals through its partnership with agoda.com, leading Asia-based online hotel reservations company that specializes in the lowest discount hotel prices. Its network includes more than 160,000 hotels worldwide.